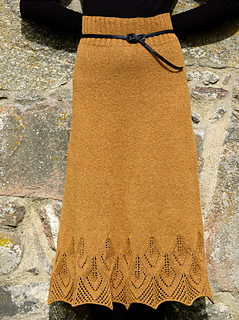 Yes I know, you have to have a good body to wear a knitted skirt (although a slip underneath will work wonders). But I just had to make this dramatic, almost Gothic skirt with its intricate lace border. It is worked from the top down to make the most of the pattern. 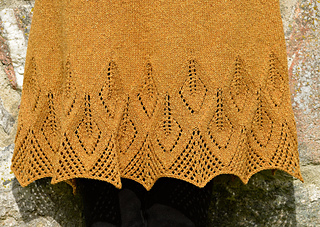 Length 36¼ in / 92 cm (27½ in / 70 cm + the lace border approx. 8¾ in / 22 cm from the first increase on Row 0 to the stretched points). Optional Round elastic 2–5 times personal waist or hip measurement.